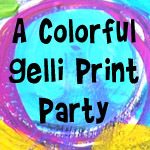 I’ve been meaning to do this post for a while but I knew it would be long and perhaps of interest to only a few people who are not happy to just use printables as they are. For most people just finding and printing a set is technological enough!But for those who are happy to take a few more steps to post-process a download, this may increase the usefulness of all those printables they have collected. 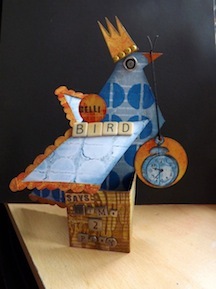 There are three ways that I use – there are likely to be more, but as I am using PSE (not full Photoshop) and my own printables are available as PDFs because that seems to be what most people are comfortable with, that is where I am focusing. For all the methods, the first step is to open the page of the PDF you want to work on. 1. 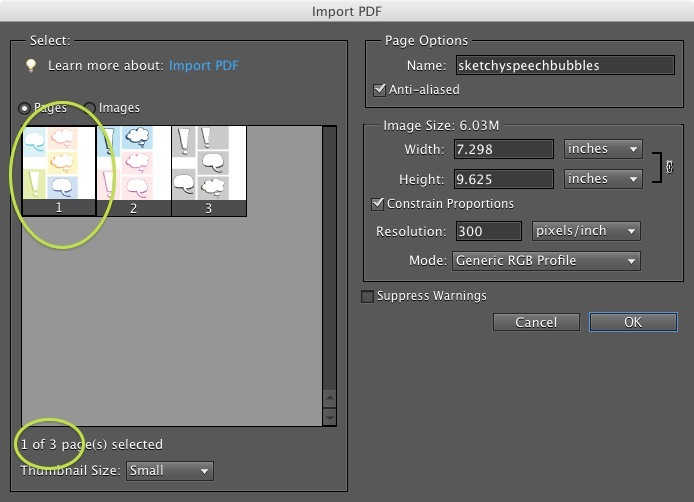 Open the PDF with Photoshop Elements. If the PDF is multiple pages you will have to pick one to work on. When done you can then open again and pick another. 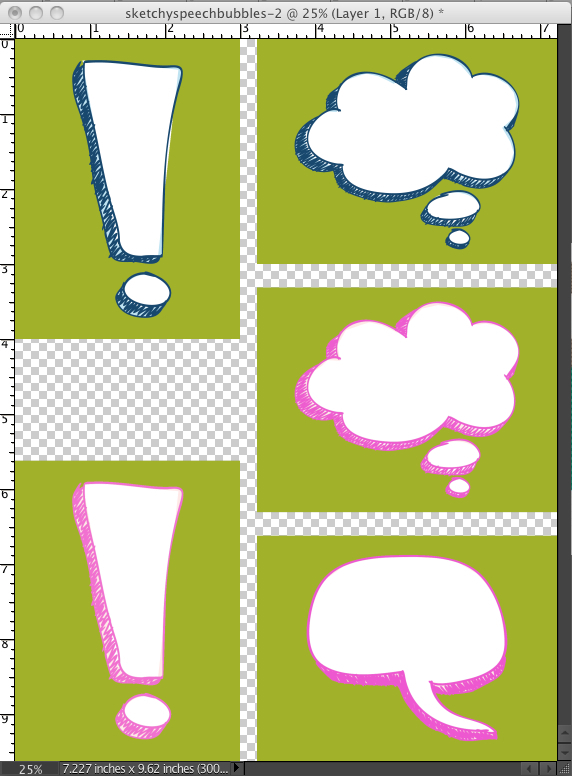 I am using my most recent printables as the sample. NOTE: If you want to make sure the original stays as it is, be sure to DUPLICATE the file and work on the copy. If you forget to do this, don’t worry – at the END of your colour-tweaking, just be sure to SAVE AS and give it a new file name. WORKS WITH: either COLOURED or B&W images. The hue options will be slightly different, depending, so you might find it hard to get an exact colour using the sliders. This is the easiest, but it does take a little prep (selecting areas) and tweaking. It’s best if you just want a broad colour change and not a very specific colour, but it does let your use sliders ti see a range of options quickly and easily. 3. Using the Magic Wand, select the area you want to change. I generally find that a Tolerance of 40 works pretty well. 4. Tick COLORIZE and using the sliders watch the colours change. 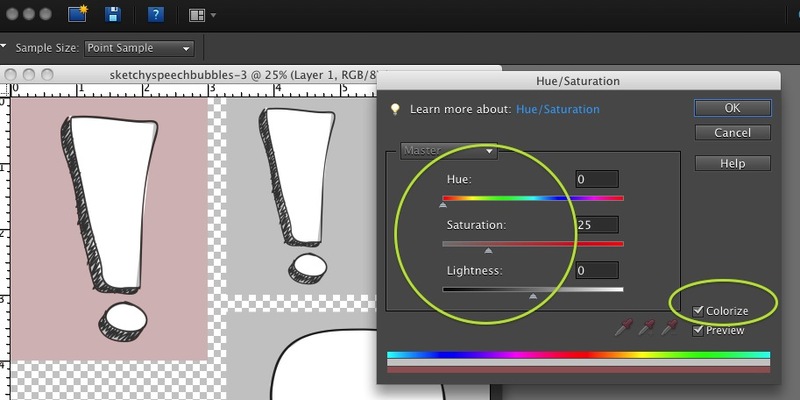 You can use the HUE slider to get the general colour, then the Saturation and Light sliders to tweak it to get the shade you want. Depending on the printable, you may need to select multiple areas. Above I’ve selected the BACKGROUND area then changed it. DESELECT the selection then select a new area. Here, with a tolerance of 40, I was easily able to select the sketchy lines and change the colour of that. You can see I changed the background to one colour and the sketchy lines to a completely different colour. If you DON’T use a selection tool, the problem with this method is it will change ALL the colours – so in this case the pale blue, the pale pink, the bright blue and pink, AND the white. You cannot tweak one colour, they will all change to the same HUE but in different proportions, depending on the original colour. Once you are happy with it be sure to SAVE (if you duplicated the original) or use SAVE AS and give it a new name if you’ve been working on the original. 2. Click ENHANCE > ADJUST COLOR > Color Variations. You will see a box that shows variations on the colours. 2. The main screen isn’t very helpful but if you take the ADJUST COLOR INTENSITY slider right to the top you can see that the preview buttons show a much wider range of variations. 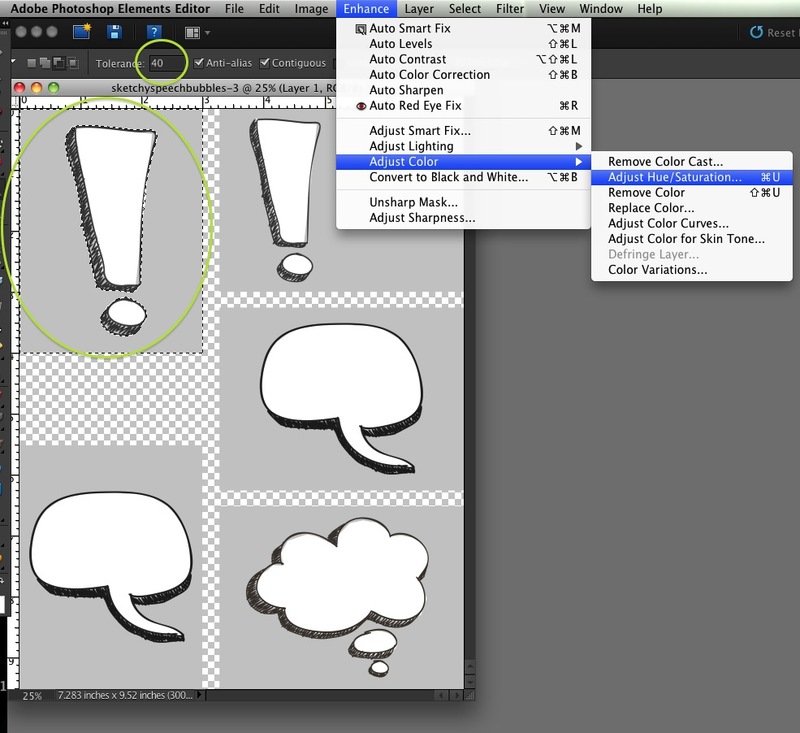 And by clicking MIDTONES, SHADOWS, and HIGHLIGHTS you will see even greater variation. 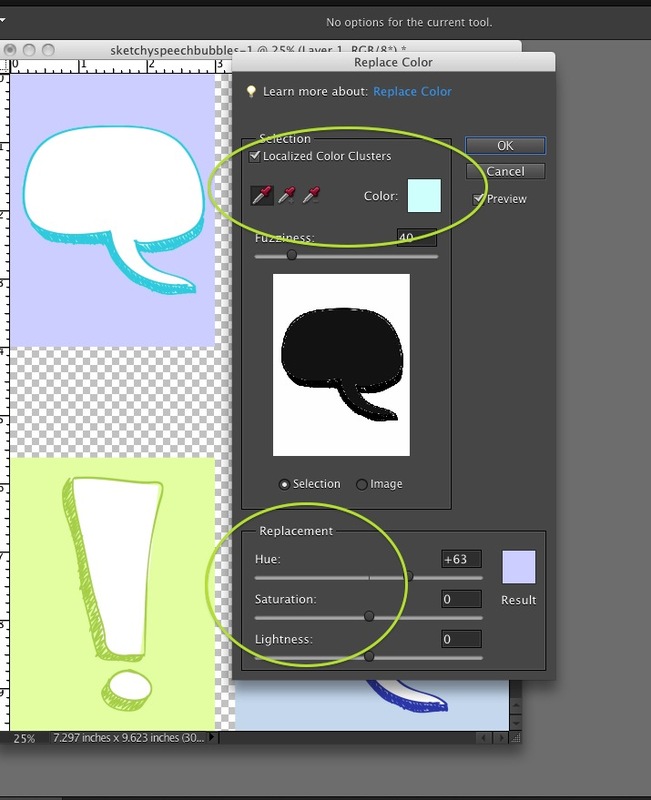 I find this most useful if I want a slightly different shade of the existing colour – while you CAN completely change a colour (as I did, from the blue to the green above) it doesn’t allow you to get a really precise shade. 3. Again, SAVE AS if not working on a duplicate image. You will see a box. Using the first eyedropper select the colour to change. 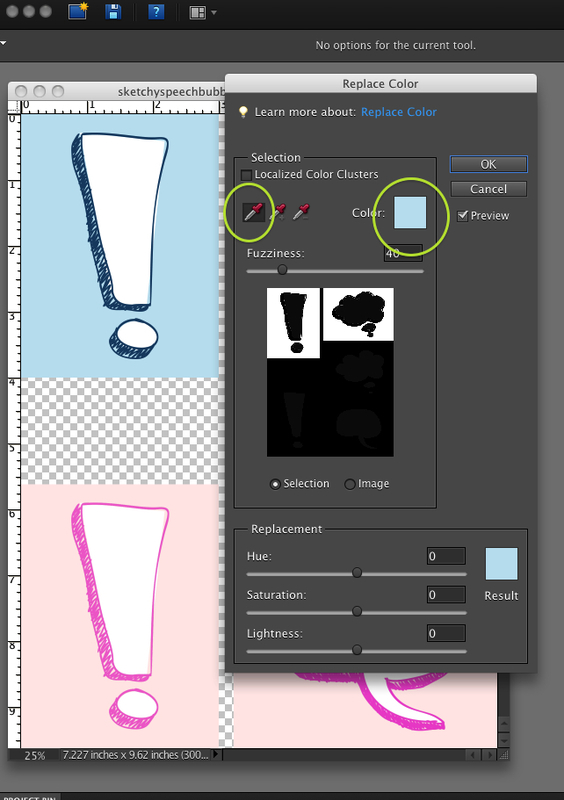 With an area selected with the Magic Wand ONLY THAT AREA OF COLOUR WILL BE CHANGED. 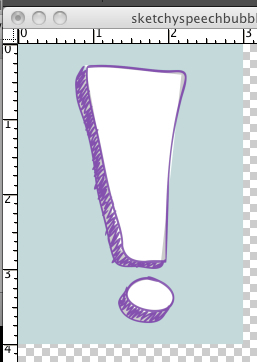 So if you want ONE of the printables on a page to be changed use the Magic Wand. 3. Using the sliders, scroll thru the variations. 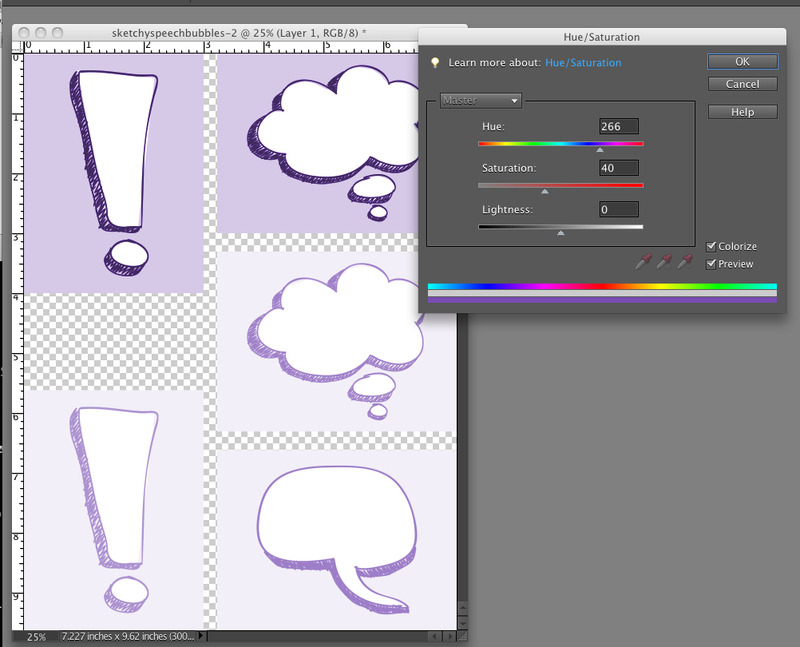 I find adjusting the HUE first, then tweaking the basic color with the Saturation and Lightness sliders works best. You may disagree…. If you want to change a colour on a whole page, this will change ALL the areas with that colour if you don’t select with the Magic Wand. So in the case of the Blue and Pink pages, selecting the pale blue with the eyedropper will mean all the pale blue areas will be changed. This can be really helpful if there are lots of small areas in a single colour and you don’t want to select every one of them. Can you see it is showing ALL the areas of pale blue in the middle box? Once you start using the sliders you will see all those areas are changing at the same time. 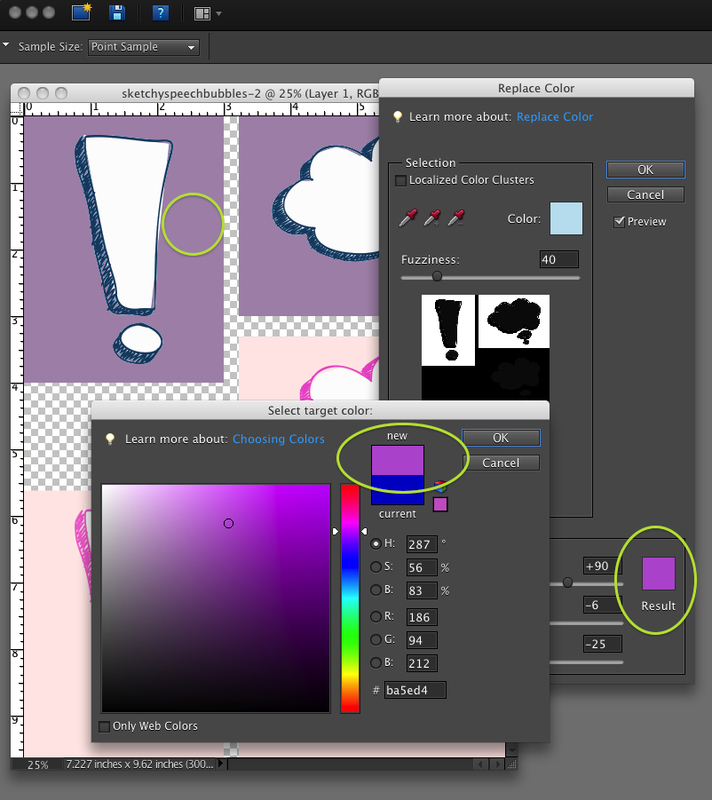 Now, reading the HELP pages it would SEEM to say that if you click on the RESULT box to bring up the Color Picker tool you can PICK the exact colour you want. I cannot for the life of me make that happen. what SEEMS to happen is the original colour is replaced with a mixture of that colour and the one you’ve picked. I hope this shows that. Can you see that bright purple? See the dusty purple colour of the printable? It sure looks like a blending to me. 4. Again, SAVE AS if not working on a duplicate image. This is perhaps the most time-consuming method, but also the most specific. 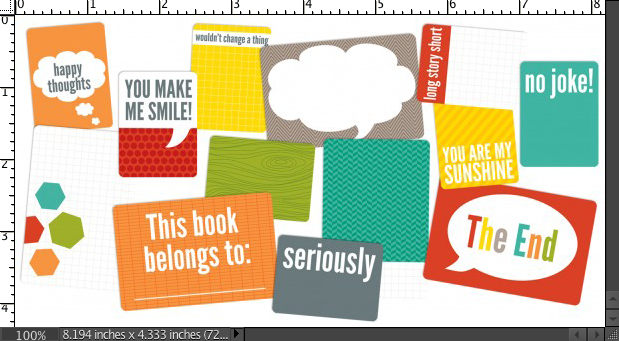 Let’s say you really like my sketchy speech bubbles but you just got the Coral edition of Project Life cards and really want things to match a bit better. My colour choices disappoint you. 2. After you have opened up your PDF, and selected the area to change, go off to the web and find a good image of the collection you want to match. 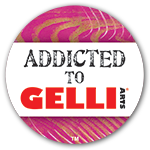 Ideally the biggest, highest quality image you can find, but a small one will work OK. You may not make the colours match PRECISELY, but you will still be able to get them close enough that the printables will look good next to the proper versions. 3. Open the Colour Picker. You can either click on the Foreground/Background icon or click the eyedropper. Using the eyedropper, pick the colour you want to fill your selection with from the sample image. Here you can see I picked the orange. Bear in mind a low-quality image is pixels of colour – you may need to click around on various areas of the colour to get one you like. ZOOM IN, and you can use the eyedropper on a pixel of true colour rather than getting a blending or shading pixel. 4. Use the Paint Bucket to fill the selection with your colour. Here you will see I selected ALL the background areas and the olive-green. 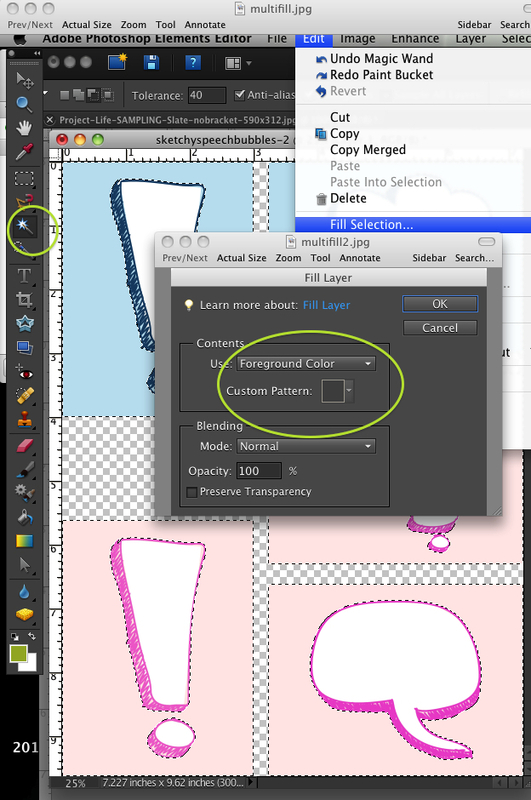 You can EITHER just apply the paint bucket to each area, one at a time OR you can fill all the selected areas at once by clicking EDIT > FILL SELECTION then picking Foreground Color (that you already set to match PL sample) from the drop-down menu. And you would get ALL the areas selected filled at once. 5. Again, SAVE AS if not working on a duplicate image. Well, that was long. Hopefully ONE of these methods will suit you – or perhaps they all will at different times. 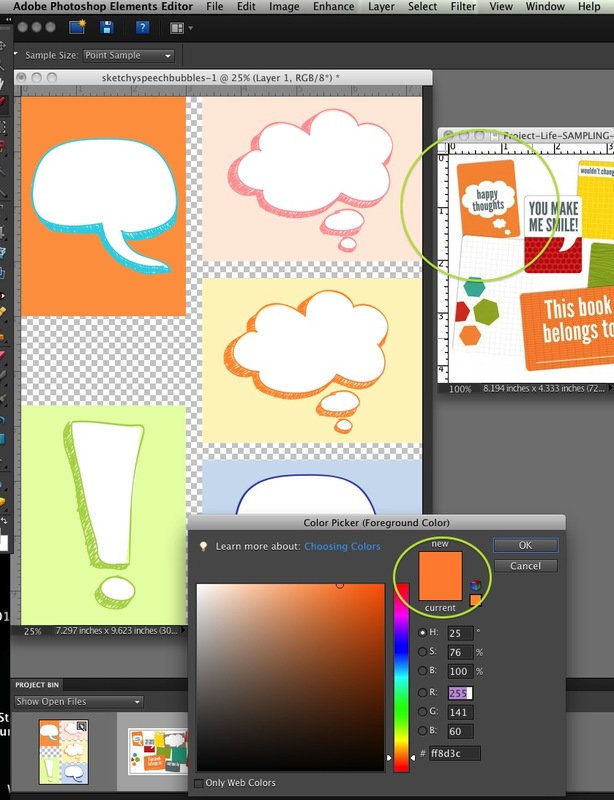 If you know another useful method to change colours of PDF printables, comment. Categories: printables, Project Life, tutorial | Tags: how-to, printables, Project Life | Permalink.